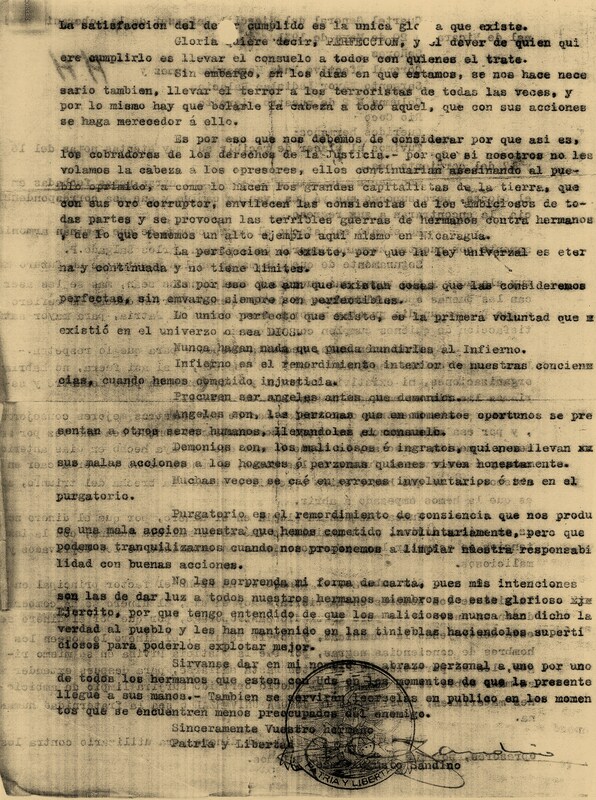 THIS IS THE SEVENTH PAGE of documents for the FIRST HALF of 1931 on Nicaragua's Caribbean Coast region, housing materials dated in the sixteen days from May 16 to 31. Continuing with the same sets of themes & issues infusing the previous pages, we see here yet another petition from the Coast – this time from the Creoles & Miskitu Indian communities of Bluefields – for separation from the “tyranny” of Nicaragua (18 May) – followed three days later by yet another – not a petition, but a “program” (never implemented, apparently) for the “Organization & Operation of the Misquito Industrial Corporation” (21 May). It matters less that both were considered by the British Foreign Office to be wholly impractical & unworkable, than it does that both offer concrete expressions of indigenous & Creole political & cultural sentiments. On a different tack, and following up on Austin Murphy’s gripping eyewitness account on the previous page, we see here a similar eyewitness narrative – this one from Mr. A. G. Earle, a cashier at Bragmans Bluff (18 May). 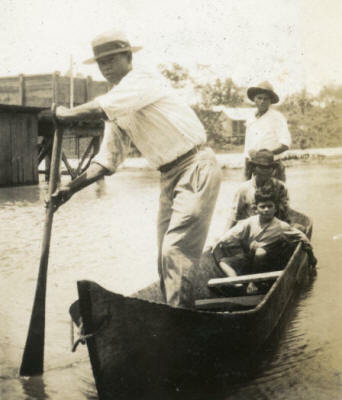 Meanwhile, Sandino continues to regroup, reorganize & smooth over simmering antagonisms among his troops in the wake of the Atlantic Coast offensive, as seen in his never-before published letter to Col. Inés Hernández Gómez (the brother of infamous Conservative cortacabeza Anastasio Hernández) and Sgt. Major Ladislao Palacios (20 May). 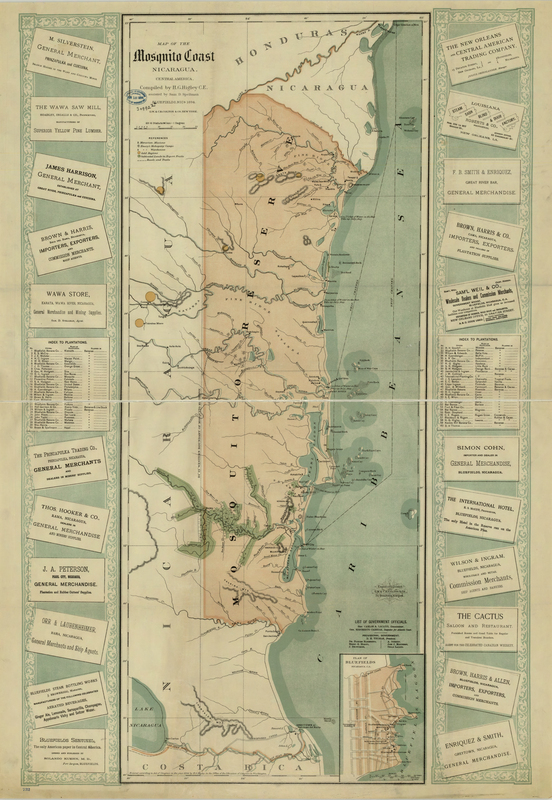 And, in another variation on the theme of Guardia protection of property & commerce, the question of how to pay for proposed Guardia posts along the Río Coco forms the subject of a series of missives between high-ranking Guardia officers and Cabo Gracias a Dios businessman Manuel C. y Bordas (26, 29 & 30 May). But the page’s highlight is surely the captured 16-page EDSN “guard book,” penned mostly by Gens. Zacarías Padilla & Juan Santos Morales — a fascinating chronicle of the column’s organization & activities over the 40-day period from 20 April to 29 May. Mostly formulaic, the book's daily entries nonetheless offer a unique, insider's look at the trials & tribulations of Sandinista rebels in the midst of a “rigorous campaign” to bring their revolution to the Coast. Petition on behalf of the Mosquito Indians and Creoles, from Mr. Edward Wilson, Creole, and Mr. Alfred Gordon, Indian, Bluefields, to the Under Secretary of State Foreign Affairs, Downing Street, London, Eng., p. 1. Petition on behalf of the Mosquito Indians and Creoles, from Mr. Edward Wilson, Creole, and Mr. Alfred Gordon, Indian, Bluefields, to the Under Secretary of State Foreign Affairs, Downing Street, London, Eng., p. 2. "Sir; We the undersigned petitioners in behalf of the Mosquito Indians and Creoles of Bluefields beg most respectfully to place this petition before His Gracious Majesty the King of England etc. for his favourable consideration and action. Your humble petitioners beg most respectfully to state in behalf of the Indians and Creoles of the Atlantic Coast, that unless separation be made to the Atlantic Coast from Nicaragua there will forever no peace. Many Indians are being killed for no cause whatsoever. ¶ The treaty called for protection from Nicaragua, but it is to the contrary. Nicaragua cannot protect herself, she is calling out for protection at all times. Now America had all the talk where Nicaragua protection comes in? ¶ The Indians and Creoles requested a separation from Nicaragua. The Nicaraguans are a tyranical nation, and deem fit to separate from such tyrants year in year out nothing but revolutions. ¶ Now the Indians and Creoles of the Atlantic Coast demands a recognise flag to rule, not America ..."
Petition on behalf of the Mosquito Indians and Creoles, from Mr. Edward Wilson, Creole, and Mr. Alfred Gordon, Indian, Bluefields, to the Under Secretary of State Foreign Affairs, Downing Street, London, Eng., p. 3. "... if possible the Union Jack, or the Canadians and if not to be under the Jamaica Government. ¶ The recent trouble in the vicinity at Bragman shows that the Nicaraguans are a tyranical nation. The United State Government refused given protection to her own people resided in Nicaragua what says other nationalities England made the treaty with Nicaragua to protect now she is unable to protect herself and by so doing we see that she cannot protect us. We are now calling upon the British for protection, not only the Indians and Creoles but all nationalities. ¶ We have the honor to be Sir, Your obedient & humble petitioners, ¶ Edward Wilson, Creole ¶ Alfred Gordon, Indian ¶ Bluefields, Nicaragua, 18th May 1931"
Eyewitness account, "Attack by Bandits of Properties of the Bragmans Bluff Lumber Company, Puerto Cabezas," by Mr. A. G. Earle, Division Cashier, Bragmans Bluff, Puerto Cabezas, to Owen Rees, Esq., H.B.M. Consul, Bluefields, p. 1. Response of Foreign Ministry, 27 June. Eyewitness account, "Attack by Bandits of Properties of the Bragmans Bluff Lumber Company, Puerto Cabezas," by Mr. A. G. Earle, Division Cashier, Bragmans Bluff, Puerto Cabezas, to Owen Rees, Esq., H.B.M. Consul, Bluefields, p. 2. Cover letter from Consul Rees dated 30 May. Eyewitness account, "Attack by Bandits of Properties of the Bragmans Bluff Lumber Company, Puerto Cabezas," by Mr. A. G. Earle, Division Cashier, Bragmans Bluff, Puerto Cabezas, to Owen Rees, Esq., H.B.M. Consul, Bluefields, p. 6. Cover letter to British Foreign Office by Mr. Border, Managua, 7 July. Discusses Mr. Earle's suitability for a consular post. Letter from Carlos A. Bravo, Secretario Privado de la Secretaria de la Comandancia General, Managua, to Sr. Ministro Matthew E. Hanna, Managua. "COPY ¶ SECRETARIA DE LA COMANDANCIA GENERAL ¶ Managua, Mayo 19 de 1931. ¶ Estimado Sr. Ministro: ¶ Tengo instrucciones del Excmo. Señor Presidente de la República para acusar a Ud. Recibo de su apreciable carta de fecha 16 del corriente en que se refiere a los 50 hombres que aumentarán el número de guardias en la ciudad de Puerto Cabezas para proteger las propiedades de la Compañia Standard Fruit, pagados por dicha Empresa. Agradece el Sr. Presidente los informes que se sirve comunicarle y da su completa aprobación al proyecto de dotar por parte de la Compañia de un avión que prestará servicios de vigilancia. ¶ Con toda consideración y respeto tengo el honor de suscribirme de Ud. Muy atento y seguro servidor. ¶ (signed) Carlos A. Bravo, ¶ Secretario Privado. ¶ Hon. Ministro Americano, ¶ Señor Matthew E. Hanna, ¶ Presente." Letter from Gen. Augusto C. Sandino, Cuartel General del EDSN, to Señores Coronel Efectivo Ines Hernandez Gomez y Sargento Mayor Ladislao Palacios, Rio Coco, p. 1. "Cuartel General del EDSN. Señores Coronel Efectivo Ines Hernanez Gomez y Sargento Mayor Ladislao Palacios, Columna No 2 de nuestro Ejercito, Rio Coco. ¶ Queridos hermanos: ¶ Tuvimos el placer de recibir sus muy atentas notas del 16 y 17 del corriente mes. ¶ Con fecha reciente contesté a sus otras notas fechadas en el Ojoche, pero supongo que ya Uds van de camino y que esa correspondencia la encontraran a su regreso. ¶ Me siento satisfecho al darme cuenta de que caminan armoniosamente con nuestro hermano General de Division Carlos Salgado P. ¶ Segunamente de que Uds estan en las puertas de un futuro muy alagador y que tanto mas cuerdos y disiplinados sean, mas se les asercan las buenas oportunidades. Al decir buenas oportunidades, me refiero a que pueden un dia prestar mayores servicios a la Patria, para mayor satisfaccion de quienes cumplen con su dever. ¶ Todo buen Jefe, necesita respetar para que lo respeten. Pues no es posible respetar a quien no respeta, y si asi fuera, no habrian organizaciones, ni existiria la moral y todo sería en puro desastre y seriamos las fieras mas peligrosas. ¶ Nuestras conciencias han de ser nuestras mejores consejeros, y por esa misma razon, es bueno acostumbrarse aunque sea una vez por semana, a meditar a solas, lo bueno ó malo que se haya hecho en dias anteriores, y á observar el futuro de las cosas, a manera de no volver a caer en abismos, si es que hemos caido o seguir abriendo la brecha del triunfo, si es que la hemos empezado á abrir. ¶ Nunca busquen la gloria en el dinero, por que el dinero no es de origen divino, y su nacimiento fue de la malicia humana, con la intencion de acumular los esfuerzos ajenos en beneficia de los depravados y maliciosos. ¶ Sin embargo, el dinero se ha hecho el factor principal en la vida de los hombres en la tierra. Hoy en dia, el dinero se ha conbertido en un nuevo Dios; pero es un dios antropofago, por que por el dinero se está destruyendo la humanidad, y por lo regular, el dinero lo poseen los hombres de conciencias negras, por que la Justicia Divina en su mismo rigor, les ha permitido que se arten hasta saciarse, para despues extender su mano sobre de la tierra y el pueblo oprimido surjirá limpio de ambiciones materiales, proclamando la COMUNA UNIVERSAL o sea la fraternidad humana. ¶ Hay derecho a persivir el dinero para utilizarlo contra los opresores, por que en esa epoca estamos. ..."
Source: NA127/E38/Box 30 (these are scans of photocopies of the originals). A version of this document (probably a Spanish translation of an English translation) appears in Alejandro Bendaña, La mistica de Sandino (1994), pp. 233-235. Letter from Gen. Augusto C. Sandino, Cuartel General del EDSN, to Señores Coronel Efectivo Ines Hernandez Gomez y Sargento Mayor Ladislao Palacios, Rio Coco, p. 2. "... la satisfaccion del deber cumplido es la unica gloria que existe. ¶ Gloria quiere decier, PERFECTION, y el deber de quien quiere cumplirlo es llevar el consuelo a todos con quienes el trata. ¶ Sin embargo, en los dias en que estamos, se nos hace necesario tambien, llevar el terror a los terroristas de todos las veces, y por lo mismo hay que bolarle la cabeza a todo aquel, que con sus acciones se haga merecedor á ello. ¶ Es por eso que nos debemos de considerar por que asi es, los cobradores de los derechos de la Justicia. Por que si nosotros no les volamos la cabeza de los opresores, ellos continuarian asesinando al pueblo oprimido, a como lo hacen los grandes capitalistas de la tierra, que con sus oro corruptor, envilecen las consiencias de los ambiciosos de todas partes y se provocan las terribles guerras de hermanos contra hermanos, de lo que tenemos un alto ejemplo aqui mismo en Nicaragua. ¶ La perfeccion no existe, por que la ley universal es eterna y continuada y no tiene limites. ¶ Es por eso que aun que existian cosas que las consideremos perfectas, sin embargo siempre son perfectibles. ¶ Lo unico perfecto que existe, es la primera voluntad que existió en el universo o sea DIOS. ¶ Nunca hagan nada que pueda hundirles al Infierno. ¶ Infierno es el remordimiento interior de nuestras conciencias, cuando hemos cometido injusticia. ¶ Procuren ser angeles antes que demonios. ¶ Angeles son, las perzonas que en momentos oportunos se presentan a otros seres humanos, llevandoles el consuelo. ¶ Demonios son, los maliciosos é ingratos, quienes llevan sus malas acciones a los hogares ó perzonas quienes viven honestamente. ¶ Muchas veces se caé en errores involuntarios ó sea en el purgatorio. ¶ Purgatorio es el remordimiento de consiencia que nos produce una mala accion nuestra que hemos cometido involuntariamente, pero que podemos tranquilizarnos cuando nos proponemos a limpiar nustra responsibilidad con buenas acciones. ¶ No les sorprenda mi forma de carta, pues mis intenciones son las de dar luz a todos nuestros hermanos miembros de este glorioso Ejercito, por que tengo entendido de que los maliciosos nunca han dicho la verdad al pueblo y les han mantenido en las tinieblas haciendoles superticiosos para poderlos explotar mejor. ¶ Sirvanse dar en mi nombre un abrazo perzonal a uno por uno de todos los hermanos que esten con Uds en los momentos de que la presente llegue a sus manos. Tambien se servirán leerselas en publico en los momentos que se encuentren menos preocupados del enemigo. ¶ Sinceramente Vuestro hermano ¶ Patria y Libertad [signature over seal]"
Program of Organization and Operation of the Misquito Industrial Corp. British Legation, Managua, to British Foreign Office, London, p. 1. "British Legation, ¶ Managua, 21st May, 1931. ¶ Sir ¶ I have the honour to acknowledge the receipt of your despatches No. 10 of the 10th February and No. 26 of the 1st May on the subject of certain proposals put forward by the Mosquito Industrial Committee of Bluefields for the alleviation of the distress amongst the Creoles and Indians of the Atlantic coast of Nicaragua. ¶ 2. The whole scheme appears to me to be that of an idealist and I am extremely doubtful as to the possibility of its practical application. Mr. Consul Rees, of Bluefields, states in a report to me: “This is such a big undertaking that I could not imagine how the natives could have any hope that they would be able to carry it through successfully, as it would take a very keen business man to do so and I am quite sure that there is none such among the natives.” ¶ 3. In any case it would seem to me that the present moment is not an opportune one even to think of commencing operations on the scale suggested. I cannot conceive that any British or Canadian banking institution would be willing to advance sufficient funds to enable the Mosquito Industrial Committee to carry out their programme, especially during the present period of depression. For some years past several large American companies have, as you are undoubtedly aware….. ¶ H.A. Grant Watson, Esq., ¶ &c., &c., &c., ¶ GUATEMALA [...]"
Program of Organization and Operation of the Misquito Industrial Corp. British Legation, Managua, to British Foreign Office, London, p. 2. "[...] aware, been operating on the Atlantic coast of Nicaragua and I imagine that they have done quite a lot to develop that part of the country; whether the Mosquito Industrial Committee would be able to do much more is open to question. ¶ 4. As far as I can see there would be no objection to the Committee sending a delegation to Managua to discuss the whole question with the Nicaraguan Government, but at the present critical time I imagine that the Government would not be inclined to give very sympathetic consideration to any petition put forward by the Committee. As far as I am aware the Harrison-Altamirano Treaty does not provide for the granting to Creoles and Indians of concessions and special privileges. ¶ 5. On the whole I consider that, even if the Nicaraguan Government were willing to grant the necessary concessions, the Mosquito Industrial Committee would not be capable of carrying out the ambitious scheme put forward by them and that in any case the present time is not propitious for the putting into operation of such proposals. ¶ I have the honour to be, ¶ Sir, ¶ Your most obedient, ¶ humble servant, (signed) Hugh M Arnet? [illegible ...]"
Program of Organization and Operation of the Misquito Industrial Corp. British Legation, Managua, to British Foreign Office, London, p. 3. ""[...] Bluefields, Nicaragua, January 10th 1931 ¶ PROGRAM OF ORGANIZATION AND OPERATION OF THE MOSQUITO INDUSTRIAL CORP ¶ That a Delegation of Seven(consisting of Indians and Creoles) be sent to the President and Congress at Managua with a petition which shall request the grant of a special Charter to be given to the above named Corporation which shall embody all the rights and privileges accorded the Indians and Creoles of the Nicaraguan Atlantic Coast by the Harrison -Altamirano Treaty. ¶ There shall be appended a request for other privileges which shall be necessary for the promotion and development of Industrial, Commercial, and Educational Enterprises. ¶ Should the above mentioned charter be granted, “The Misquito Industrial Corporation, shall be immediately organized which shall be an All Native Industrial, Commercial, and Educational concern consisting of a stock of not less than 50,000 shares at $50.00 per share. ¶ The Corporation shall promote develop and improve industrially the Educational, Agricultural, Mineral, Commercial and Economical possibilities of the Atlantic Coast of Nicaragua. ¶ The Agricultural Department shall cultivate extensively such production as will yield the most profit economically the development of the different branches of this department shall be operated in conjunction with Industrial Institutions. ¶ A. CEREALS., Rice, Corn, Beans and Peas,, for Home and Foreign market, ¶ VEGETABLES., Such as will prosper in climate. Home market. ¶ TROPICAL VEGETABLES, Home market. ¶ FRUITS, COCOA, COFFEE (Foreign market) ¶ CITRIC FRUITS, and other marketable fruits. ¶ PINEAPPLES, COCONUTS, SUGARCANE. ¶ MODERN MACHINERY AND POWER MILLS SHALL BE INSTALLED TO CLEANSE AND PREPARE PRODUCTS FOR MARKET. ¶ BANANAS., This staple product will necessitate a large Sea going loading plant consisting of Steam Power Barges, Motor Tugs, and steel and wooden lighters equipped to facilitate transportation to point or station of loading. ¶ TIMBER CUTTING. Machinery and Mills shall be installed for the manufacture of Lumber. ¶ CATTLE AND POULTRY farming. , Foreign cattle and poultry shall be imported to improve native breeds. ¶ Factories shall be established with modern equipment for the manufacture of By products. Factories shall be established with modern machinery for the manufacture of furniture, Casava Starch, Sugar, Basket making, Shoemaking, Tailoring, Ladies Millinery and Tailoring, Tool Handles, Coconut Oil, Coco Nut Mats., ¶ DRY DOCK ANDSHIPWAYS for building and repairing Loading Plants and coastwise and river service with machinery repair shop. River steam service consisting of Stern Paddle wheel steamers, which will be placed on navigable Rivers. ¶ COMMERCIAL INDUSTRY., Offices, Commissaries, Warehouses, and Wharves shall be established wherever it is profitable and necessary. ¶ SCHOOLS., Two Industrial (Institutions) institutes capable of accommodating 300 pupils shall be established wherever the Corporation establishes an agricultural station. ¶ Hospitals, One large general Hospital, and Dispensary shall be erected. One special Hospital for Pulmonary Diseases. Branch Hospital shall be erected wherever the Corp., establishes an agricultural station. ¶ Mining Industry., The exploiting of the mining district shall be carried on by prospecting for the different minerals which have up to the present been undiscovered. ¶ Special privileges which the Corporation, shall request in their petition to the Nicaraguan Government which shall be established for the improvement of Commercial and Educational enterprises. ¶ Establishment of two Radiographic stations for sole use of Corporation and Industrial Instruction. [...]". Program of Organization and Operation of the Misquito Industrial Corp. British Legation, Managua, to British Foreign Office, London, p. 4. "Bluefields, Nicaragua. January 10th 1931. PROGRAM OF ORGANIZATION AND OPERATION OF THE MISQUITO INDUSTRIAL CORP," p. 2 of 2. Letter from Willard L. Beaulac, Charge d'Affaires, Managua, to Gen. C. B. Matthews, Jefe Director GN, Managua. "Managua, May 21, 1931. 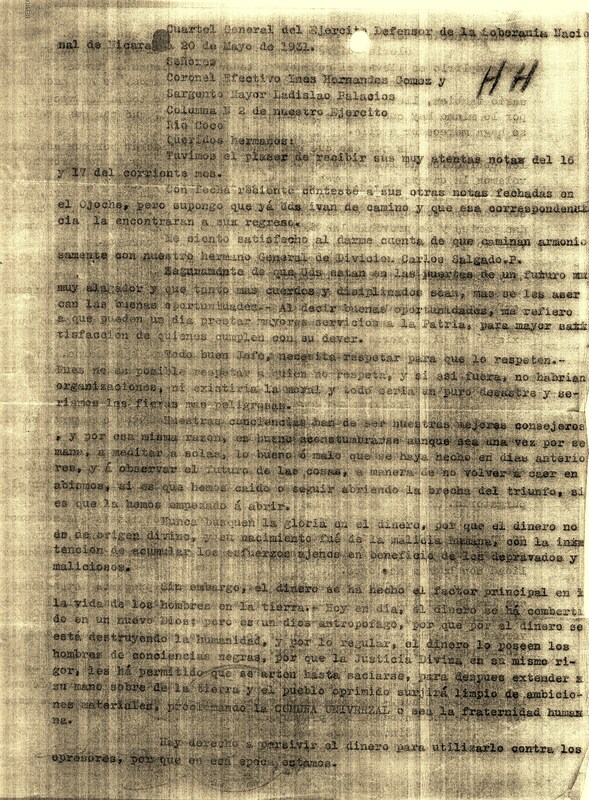 ¶ My dear General Matthews: ¶ With reference to the dispatch of 50 Guardias to Puerto Cabezas concerning which you informed the Legation recently, I am pleased to transmit herewith a copy of a letter addressed to the legation by the Private Secretary of President Moncada on May 19, 1931, in reply to the Minister’s letter of May 15, 1931, a copy of which has already been furnished you. It should be noted that President Moncada gives his full approval of the project which the Standard Fruit and Steamship Company has in mind for providing an airplane to further assist the Guardia. ¶ I am, my dear General Matthews, ¶ Sincerely yours, ¶ Willard L. Beaulac, ¶ Chargé d’Affaires a.i. ¶ Brigadier General C. B. Matthews, G.N., ¶ Jefe Director of the Guardia Nacional, ¶ Managua. ¶ Encl." Instructions relative to accountability for funds received from Standard Fruit Company. From 2nd Brigade Quartermaster M. C. Gregory, Managua, to Eastern Area Quartermaster, Bluefields, p. 1. "HEADQUARTERS-GUARDIA NACIONAL DE NICARAGUA. ¶ OFFICE OF THE QUARTERMASTER. ¶ Managua, Nicaragua. ¶ 22 May, 1931. ¶ From: The Quartermaster. ¶ To: The Area Quartermaster, Eastern Area, Bluefields, Nicaragua. ¶ Via: The Area Commander. ¶ Subject: Instructions relative to accountability for funds received from Standard Fruit Company. Reference: (a) Radio, 09419 May-31, J.D., to A.C., E.A. ¶ 1. The following instructions will govern in connection with the accounting for funds received from the Standard Fruit Company in connection with the detailing of fifty enlisted men to Puerto Cabezas for the purpose of affording protection and security to the Company’s property: TO BE COLLECTED FROM COMPANY AND FORWARDED TO THE PAYMASTER, G. N. MANAGUA, NICARAGUA. ¶ Cost of transportation of total movement. ¶ $ 377.06 ¶ (Standard Fruit Co. furnishing own tug from Colorado Bar to Puerto Cabezas) ¶ Cash advanced for rations for trip. ¶ 50.00 ¶ 50 Initial outfits of clothing and equipment, at $28.00 ¶ 1,400.00 ¶ Total ……………… ¶ $1,827.06 ¶ TO BE COLLECTED FROM COMPANY EACH MONTH AND TAKEN UP BY THE AREA QUARTERMASTER IN HIS ACCOUNT CURRENT IN USUAL MANNER. ¶ Clothing allowance of 50 men at $.06 per day per man, effective date to be that upon which detail arrives at Bluefields. NOTE: Clothing allowance is based on the actual number of days in each month. ¶ Clothing will be issued as required in the same manner as to the balance of the Guardia, accounting for same to be in accordance with existing regulations. ¶ Subsistence allowance of 50 men at .20 cents per diem. ¶ In all cases therefore the Detachment will be subsisted as is other personnel of the Guardia in the Area, the Standard Fruit Company advancing to the Area Commander, Eastern Area, the cost of each subsistence (i.e. .20 cents per diem) for fifty (50) men each month. Effective date relative to subsistence will be the date of arrival at Bluefields of the Detachment. [...]"
Instructions relative to accountability for funds received from Standard Fruit Company. From 2nd Brigade Quartermaster M. C. Gregory, Managua, to Eastern Area Quartermaster, Bluefields, p. 2. "[...] -2- ¶ 2. Should the Standard Fruit Co., desire to subsist the men at any of the stations same may be handled in the identical manner with that of any contract mess, the contract to be at the rate of .20 cents per diem which, in effect, returns the ration money for the number of men involved to the Standard Fruit Co., in exchange for their subsistence of such men. TO BE COLLECTED FROM COMPANY AND TAKEN UP BY THE AREA QUARTERMASTER IN HIS ACCOUNT CURRENT IN USUAL MANNER. For pay of the following enlisted Guardia from May 19 to May 31, 1931, 12 days: ¶ 1 Sergeant Major, at $40.00 per month $ 16.00 ¶ 2 Sergeants. “ 25.00 “ “ 20.00 ¶ 6 Corporals “ 18.00 “ “ 43.20 ¶ 41 Privates. “ 12.00 “ “ 196.80 ¶ Total for May, 1931……….. $276.00 ¶ Pay for succeeding months to be based on the number of men on this duty, by rank, at the rates shown above. ¶ 3. Funds collected under the above schedule will be accounted for on the account current and will become available for maintenance of the Eastern Area for the ensuing month and in the request for monthly allotments such funds will be taken into consideration and will be reported as unallotted funds on hand. ¶ 4. It is requested that a monthly report be submitted to this office covering the following information, ¶ Account received from Standard Fruit Co., under the following headings:- ¶Clothing. ¶Subsistence. ¶Pay. And any further pertinent information connected with the situation arising from the assignment of this special detachment. ¶ M.C. Gregory." "Trifulca entre Marinos Yanquis y Miembros de la Guardia Nacional ha Tenido Lugar en Nicaragua." 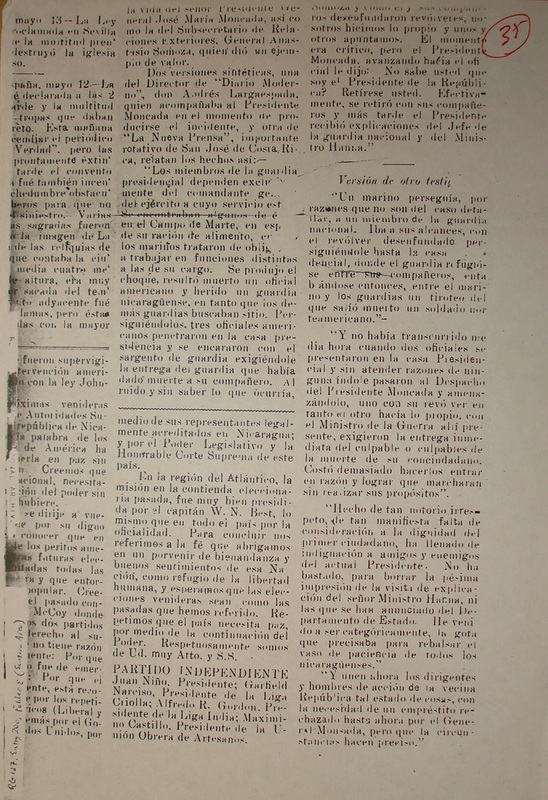 Article in La Voz del Atlántico, Bluefields, p. 1. "TRIFULCA ENTRE MARINOS YANQUIS Y MIEMBROS DE LA GUARDIA NACIONAL HA TENIDO LUGAR EN NICARAGUA. Colón, mayo 12----- También en Managua hubo reyerta entre marinos de la flota americana y miembros de la guardia presidencial con resultado de la muerte de un oficial americano. En este choque estuvo en peligro la vida del señor presidente General José María Moncada, así como la del Subsecretario de Relaciones Exteriores, General Anastasio Somoza, quien dió un ejemplo de valor. Dos versiones sintéticas, una del Director de “Diario Moderno”, don Andrés Largaespada, quien acompañaba al Presidente Moncada en el momento de producirse el incidente, y otra de “La Nueva Prensa”, importante rotativo de San José de Costa Rica, relatan los hechos así:-- “Los miembros de la guardia presidencial dependen exclusivamente del comandante general del ejército a cuyo servicio estaban se encontraban algunos de ellos en el Campo de Marte, en espera de su ración de alimento, entonces los marinos trataron de obligarlos a trabajar en funciones distintas a las de su cargo. Se produjo el choque, resultó muerto un oficial americano y herido un guardia nicaragüense en tanto que los demás guardias buscaban sitio. Persiguiéndolos, tres oficiales americanos penetraron en la casa presidencial y se encararon con el sargento de guardia exigiéndole la entrega del guardia que había dado muerte a su compañero. Al ruido y sin saber lo que ocurría, salimos el Presidente Moncada y sus acompañantes que lo eran el Ministro don José María Zelaya, el Subsecretario Gral. Somoza, algún otro funcionario y yo. Avanzó uno de los oficiales , se cruzó palabras fuertes con el General Somoza y cuando él y sus compañeros desenfundaron revólveres, nosotros hicimos lo propio y unos y otros apuntamos. El momento era crítico, pero el Presidente Moncada, avanzando hacia el oficial le dijo: “No sabe usted que soy el Presidente de la República? Retírese usted. “ Efectivamente, se retiró con sus compañeros y mas tarde el Presidente recibió explicaciones del Jefe de la guardia nacional y del Ministro Hanna.” Versión de otro testigo: “Un marino perseguía, por razones que no son del caso detallar a un miembro de la guardia nacional. Iba a sus alcances, con el revólver desenfundado persiguiéndole hasta la casa presidencial, donde el guardia refugióse entre sus compañeros, entablándose entonces, entre el marino y los guardias un tiroteo del que salió muerto un soldado norteamericano.”-- “Y no había transcurrido media hora cuando dos oficiales se presentaron en la casa Presidencial y sin atender razones de ninguna índole pasaron al Despacho del Presidente Moncada y amenazándolo, uno con su revólver en tanto el otro hacía lo propio, con el Ministro de la Guardia ahí presente [...] "
"Trifulca entre Marinos Yanquis y Miembros de la Guardia Nacional ha Tenido Lugar en Nicaragua." Article in La Voz del Atlántico, Bluefields, p. 2. " "Mine Official Ask Withdrawal of U.S. Marines - Sees Move Only Aid For Peace in Nicaragua." Article in La Voz del Atlántico, Bluefields, p. 1. "SEES MOVE ONLY AID FOR PEACE IN NICARAGUA. Bluefields, Nic., May 10. (UP) American mining companies on the East Coast of Nicaragua are not paying taxes to the Sandinistas in order to enjoy tranquility, Henry F. Springer, Superintendent of the Bonanza Mines Company, told the United Press. The Bonanza Mines Company, owned by B.C. Warnick, of Philadelphia, is the only mine operating on the east coast. Superintendent Springer, a native of New Bedford, Massachussets, who has lived in this country for forty-nine years, discounts the statement made by Dr. Jose Pedro Zepeda, Mexican representative of Sandino’s Army of Defense of the National Sovereignty of Nicaragua, last month that the mines were not being molested by bandits because of payment of taxes to Sandino’s men. “We are paying taxes in them,” Springer sardonically remarked, “with forty-one rifles, a machine gun and about fifteen men armed with revolvers. That is how we are paying Sandino. He (---) (---) come in to ask for his taxes yet. Like most of the American residents engaged in business enterprises here, Mr. Springer blames the marine occupation in the country for the troublesome state of guerrilla warfare existent. He contends that the State Department’s persistent and advertised attempts at intervention against and opposition to General Emiliano Chamorro, following his successful coup d’etat in 1925, was the foundation for this unending campaign of banditry. “In these Latin countries,” he explained, “where revolutions have been a regular occurrence for centuries, one cannot deprive the victorious side of its rights without bending into a hurricane of resentful opposition. I really wonder if the State Department did oppose Chamorro because he acquired the presidency by force, for I notice that the last year every de facto revolutionary government in South and Central America was recognized by the United States.” “It is true,” he continued, “that the decision of recognition of these governments rests solely upon the shoulders of the President of the United States, but surely the president invariably acts on such matters upon the advice of the Secretary of State. Where the Chamorro incident began to mould sentiment against the Americans,” Mr. Springer went on, ”the action of Mr. Stimson at Tipitapa by calling a truce of Moncada’s campaign against the Diaz Government fanned the flames of resentment to what was to grow into this big blaze of guerrilla opposition. The Tipitapa agreement might have satisfied the political leaders of both factions, but the layman was not considered. This (---) far-flung country. Means of communication are miserable. Travel is slow and difficult. The Sacasa forces were fighting for what they termed as an ideal. American intervention in the (---) deprived them of attaining their goal. 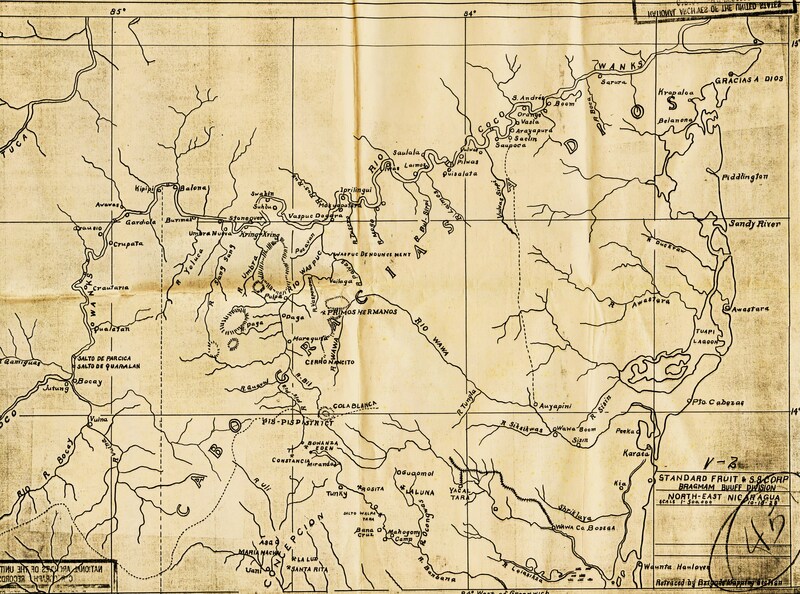 The so-called “mozos” or peons in those ranks did not forget that.” Asked what he thought might be a possible solution to the problem of eliminating this organized banditry, Mr. Springer said he believed the construction of highways throughout the strategic points wherein the bandits operate would enable forces to move about rapidly and advantageously. There are no legitimate roads available through the dense jungle and mountainous area of Jinotega, Nueva Segovia, Cabo Gracias and other sections where the Sandinistas operate regularly. Another probable solution, he suggested, would be to let President Moncada build his own army, for the United States Government to compel him to install his own officers to command the men. Mr. Springer charges that the American Marine officers in the Guardia Nacional de Nicaragua “virtually want to run the country.” He said that at one time he addressed a communication to the President requesting guardia protection at the mines. Moncada replied, advising him to refer his letter to General McDougal, then commanding the Guardia Nacional. [...] "
"Mine Official Ask Withdrawal of U.S. Marines - Sees Move Only Aid For Peace in Nicaragua." Article in La Voz del Atlántico, Bluefields, p. 3. "[... continuation of same article ...] “Can you beat it?” Mr. Springer asked. He did not receive any protection there, he asserted. ¶ Since the day of the Tipitapa Agreement, $400,000 worth of damage has been done to the Bonanza Mines by Sandinistas. Last month, at the time of the Puerto Cabezas outbreaks, the bandits did damage amounting to $75,000 at the mines, and killed one employee, an Indian. They destroyed the generator and blew up the dam. ¶ “We made a great mistake when we occupied this country in the first place,” Mr. Springer concluded, “We should give protection. That is all. Any country that cannot protect its citizens doesn’t deserve to exist. Of course Nicaraguans don’t want their own people killed by Americans. Let them fight their own outlaws”. ¶ Explaining the plan for the withdrawal of the Marines, Secretary Stimson stated that the program which had been outlined by Maj. Gen. Frank R. McCoy and Brig. Gen. Douglas McDougal called for the withdrawal of all combatant forces of Marines. ¶ At the time the plan was drawn up here were two reserve forces of 200 or more Marines in the northwest provinces where the bandits were still active, a sort of reserve to support the actual patrolling which was being done by the Guardia, Secretary Stimson explained. Even then, he stated, the Guardia was doing the actual patrolling and fighting despite the fact that it was one of these forces of Marines which was ambushed in January while mending a telephone line eight Marines being killed. ¶ The purpose of the plan, Secretary Stimson explained, was to make it no longer necessary to station these reserve Marines in the bandit area, but to replace them with an equivalent reserve of Guardia. [END]"
Letter from Gen. C. B. Matthews, Jefe Director GN Managua, to Sr. Manuel C. y Bordas, Cabo Gracias a Dios, p. 1. ([English translation.] "Dear Sir: ¶ I have your letter of May 6, 1931, and wish to thank you for the information you have furnished which is of interest to this office. ¶ In regard to your claim it will be necessary for you to put it before the Claims Commission of the National Government, as I explained in my letter of April 28, and when called upon to do so by the officials of that department, the Guardia will be glad to furnish them with the facts of the case. ¶ We appreciate the desirability of stationing a detachment of Guardia at Waspock, but as you know the economic condition of the Republic has, compelled the Guardia to operate at a minimum of expense. It is the tremendous cost of transportation of men to and from Waspock as well as the difficulty and expense of maintaining communication with them which is the principal deterring factor in the establishment of a post in that place. You will also realize that a post so isolated and so distant necessarily must be strong enough to meet any contingency as it could not depend on reinforcements from other detachments if attacked in force within any reasonable length of time. This means that to be of any value the post would have to have at least thirty men and two officers. ¶ This organization is not authorized to enter into negotiations with private parties for arranging expenses to support special detachments of Guardia. I, therefore, suggest that the proposition you have made be placed before the President of the Republic, and if authorized by the President I shall be only too pleased to undertake the raising of a force and the establishment of necessary Guardia command to furnish the protection which you seek and which I realize you so badly need." Conditions at Neptune Mine. Col. C. A. Wynn, Bluefields, to Jefe Director GN, Managua. Radiogram from Gen. C. B. Matthews, Jefe Director GN, Managua, to Col. C. A. Wynn, Bluefields. "HEADQUARTERS IS CONSIDERING PROPOSITION BY SENOR MANUEL BORDAS NICARAGUAN PRODUCTS COMPANY CAPE GRACIAS WHEREBY COMPANY WILL AGREE TO PROVIDE FUNDS FOR TWENTY GUARDIAS FOR A POST OF TWO OFFICERS AND THIRTY MEN AS WASPOOK GUARDIA NACTIONAL TO PROVIDE OFFICERS AND THE TEN ADDITIONAL MEN FROM PRESENT EASTERN AREA STRENGTH PERIOD ADDITIONAL OFFICERS TO BE SENT FROM HERE PERIOD IS IT PRACTIABLE TO ENLIST TWENTY MEN IN YOUR AREA OR WILL THEY HAVE TO BE SENT FROM HERE PERIOD COPIES OF ALL CORRESPONDENCE IN MAIL MATTHEWS 12029 MAY 31"
Radiogram from Col. C. A. Wynn, Bluefields, to Gen. C. B. Matthews, Jefe Director GN, Managua. 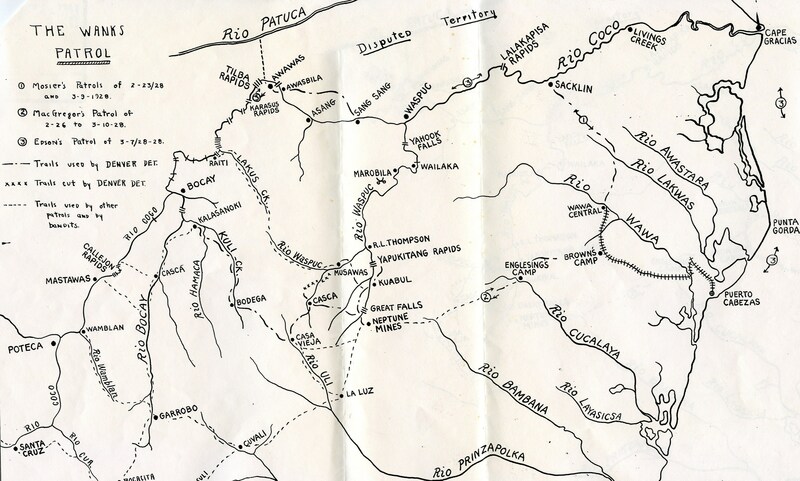 "YOUR 12029 MEN WILL HAVE TO COME FROM MANAGUA PERIOD AREA NOW SEVEN UNDERSTRENGTH WITH EIGHT DISCHARGES IN JUNE PERIOD WILL HAVE DIFFICULTY OBTAINING RECRUITS REQUIRED NORMAL ATTRITION PERIOD STRONGLY RECOMMEND LOCATION POST EITHER SACKLIN OR KISALAYA IN PREFERENCE WASPOOK PERIOD WASPOOK TWO HUNDRED MILES FROM CAPE GRACIAS ONLY MEANS COMMUNICATION RAPIDS BETWEEN KISALAYA AND WASPOOK 14329 MAY 31 WYNN"
Captured EDSN Guard Book on Atlantic Coast Expedition, April-May 1931, led by Generals Juan Santos Morales, Zacarías Padilla & Pedro Antonio Irías, p. 1. SOURCE: Marine Corps Research Center, Quantico VA, Personal Papers Collection, Box "Sandino". Captured EDSN Guard Book on Atlantic Coast Expedition, April-May 1931, led by Generals Juan Santos Morales, Zacarías Padilla & Pedro Antonio Irías, p. 2. "Orden General que la Secretaria Particular de la Jefatura Suprema de nuestro EDSNN, expide en 'Leymus' del da 20 al 21 de Abril de 1931. ¶ Nombrase Jefe de Dia de hoy para mañana al hermano Teniente Coronel Juan Altamirano, y para mañana el que se desigue? ¶ Servicio el de rigurosa campaña. ¶ Jefes, Oficiales y Soldados. ¶ Queridos hermanos. ¶ Habiendo faltado el hermano General Pedro Blandón muerto recientemente por una de las bombas que arrojarón los aviones en los Campos de Operaciones de 'Logtón', me permito manifestarles en mi carácter de Secretario Particular de la Jefatura Suprema de nuestro mismo Ejército, que de esta fecha en adelante quedará organizada provicionalmente la columna en la forma siguiente: 1er Jefe de la Columna Coronel Zacarías Padilla, Segundo Jefe Sargento Mayor Lazaro Salinas, ..."
Captured EDSN Guard Book on Atlantic Coast Expedition, April-May 1931, led by Generals Juan Santos Morales, Zacarías Padilla & Pedro Antonio Irías, p. 3. "... 1er Jefe de Avanzadilla Capitán Fernando Cruz. 1er Jefe del Cuerpo de Artillería Teniente Coronel Ruperto Hernandez; 1er Jefe de Esado Mayor Coronel Juan Altamirano, 2o Jefe de Estado Mayor Coronel Pedro Navarro. 1er Jefe de la Retaguardia, Cap. Eudiviges Vallecillo. ¶ Comuniquese y Cumplase. ¶ Patria y Libertad /s/ J. S. Morales R. Srio Particular de la Jefatura Suprema. ¶ Orden General que la Secretaria Particular de la Jefatura Suprema de nuestro EDSNN expide en 'Leymus' del dia 21 al 22 de Abril de 1931. ¶ Nómbrase Jefe de Dia ..."
Captured EDSN Guard Book on Atlantic Coast Expedition, April-May 1931, led by Generals Juan Santos Morales, Zacarías Padilla & Pedro Antonio Irías, p. 4. "…de hoy para mañana al hermano Coronel Pedro Navarro y para mañana el que se nombre. ¶ Servicio el de rigorosa campaña. ¶ Jefes, Oficiales, y Soldados. ¶ Queridos Hermanos: ¶ Reconoceian como ayudantes de 1er Jefe de la Columna Coronel Zacarías Padilla a los hermanos Teniente Luciano Gutierrez, Sub-Tenientes Ignacio Blandón Rios, Gregorio Olivas y Eulogio Flores; como ayudantes del 1er Jefe de Estado Mayor Capitán Franco Helis y Juan Ferreti como ayudantes del 2o Jefe de Esta Coronel Juan Altamirano, Sub-Teniente Simon Blandón Rios; como ayudantes de 2o Jefe de Estado Mayor Coronel P. Navarro, Capitán Francisco Helis y hermano Juan Ferretti; como ayudantes del 2o Jefe de la Columna hermano Sargento Mayor Lasaro Salinas, Teniente Juan Rodríguez y Bernabé Gómez; como ayudantes del 1er Jefe del Cuerpo de Artillería Teniente Coroneles Ruperto Hernández, sub-Tenientes Cleto Centeno y Justo Duarte; como ayudantes del 1er Jefe de la Retaguar …"
Captured EDSN Guard Book on Atlantic Coast Expedition, April-May 1931, led by Generals Juan Santos Morales, Zacarías Padilla & Pedro Antonio Irías, p. 5. "… -dia Subteniente Antonio Chavarria. ¶ Comuniquese y Cumplase, ¶ Patria y Libertad, ¶ Juan Santos Morales R, Srio Particular de la Jefatura Suprema. ¶ Orden General de la Jefatura de Operaciones, expedida en la 'Boca de Wuaspuc', del dia 23 al 24 de Abril de 1931. ¶ Nómbrase Jefe de Día de hoy para mañana al hermano Teniente Coronel Ruperto Hernández, y para mañana el que se designe. ¶ Servicio el de rigurosa campaña. ¶ Jefes, Oficiales y Soldados. ¶ mis muy queridos hermanos: ¶ Tengo á bién manifestarles que desde esta fecha consideramos como hermanos en la Patria y compañeros á todos los compatriotas que con el mayor entusiasmo se nos han presentado de los diferentes Campos de …"
Captured EDSN Guard Book on Atlantic Coast Expedition, April-May 1931, led by Generals Juan Santos Morales, Zacarías Padilla & Pedro Antonio Irías, p. 6. "… trabajadores del Litoral Atlántico; los cuales van organizados y divididos en cuatro partes iguales para engrosar más á los cuatro cuerpos de que está compuesta nuestra Columna. ¶ Suplico una vez más a todos los antianos militares tratar con respeto y consideracion á los nuevos defensores de Honor de nuestra Amada Nicaragua. ¶ A Los Nuevos Presentados ¶ Queridos Hermanos: ¶ Considero que todos nosotros estais bien intencionados y que como honrados Centroaméricanos, estais en el deber de defender el honor de las naciones centroamericanos las cuales han sido siempre Libres, Soberánas é independientes. Hoy se encuentre oprimida nuestra bella Nicaragua por el asesino invasor imperialista norteamericano, cosa que nosotros estamos protestando energeticamente desde ha cinco años, y moriremos con el arma en la mano mientras haya intervención de paises expansionistas. ¶ Hermanos: ¶ Proseguido nuestro Ejemplo, pa …"
Captured EDSN Guard Book on Atlantic Coast Expedition, April-May 1931, led by Generals Juan Santos Morales, Zacarías Padilla & Pedro Antonio Irías, p. 7. "… -ra honra vuestra y de todas las generaciones porvenir. ¶ Comuniquese y cumplase. ¶ Patria y Libertad. ¶ Z. Padilla R., Coronel. ¶ Orden General de la Jefatura de Operaciones, expedida en 'Aguas Vila', del dia 29 al 30 de Abril de 1931. ¶ Nómbrase Jefe de Día de hoy para mañana al hermano Sargento Mayor Lázaro Salinas y para mañana al que se nombre. ¶ Servicio el acostumbrado. 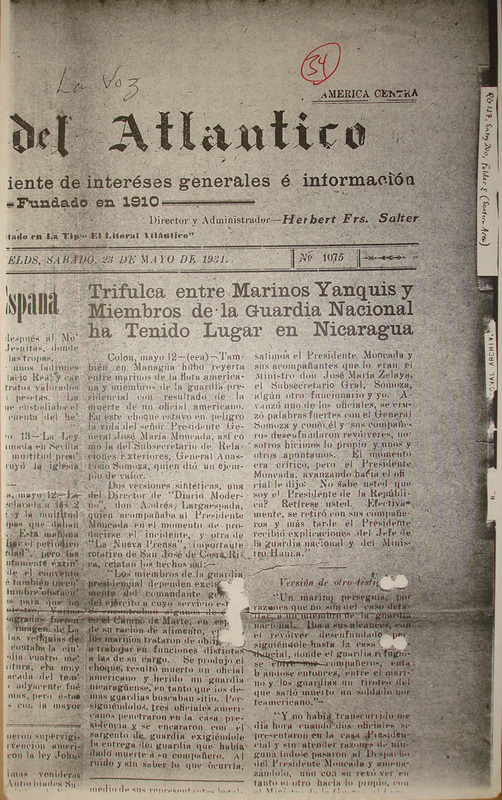 ¶ Jefes, Oficiales y Soldados, ¶ Queridos Hermanos: ¶ Queda prohibido terminantemente saquear las casas de los palenques de los hermanos los zambos quienes son los que …"
Captured EDSN Guard Book on Atlantic Coast Expedition, April-May 1931, led by Generals Juan Santos Morales, Zacarías Padilla & Pedro Antonio Irías, p. 8. " … más están prestando sus contingentes para hacer nuestro regreso y ponernos en contacto con los otros frentes de Operaciones, donde operan los demás Jefes Expedicionarios. ¶ Hay que tener presente que los mosquitos son pobres y que prestando su inmediata cooperación; es una injusticia llevarles sus cosas de uso personal, siendo más bién nosotros los obligados á darles lo que les hace falta de imperiosa necesidad. ¶ También queda prohibida el juego de dados, y se impondrán castigos ejemplares para todo aquel que no obedezca la presente orden sin distincion de gerarquias. ¶ El hermano Santiago Dietrick, cometió el error de disparar un tiro de pistola al hermano Teniente Bernabé Gomez, por lo que queda justificado el homicidio frustrado contra un hermano nuestro; esta clase de crimenes por nuestra institución militar es sumamente prohibida y es castigada con la pena de fucilamiento. Pero tenemos atenuantes el hermano Dietrick, queda dispuesada a la falta. No se dispensará altas de esta naturaleza de ahora en adelante. …"
Captured EDSN Guard Book on Atlantic Coast Expedition, April-May 1931, led by Generals Juan Santos Morales, Zacarías Padilla & Pedro Antonio Irías, p. 9. "… Comuniquese y Cumplase. ¶ Patria y Libertad. ¶ Z. Padilla R. ¶ Jefe Espedicionario Provisional. ¶ Orden General de la Jefatura de Operaciones, expedida en 'Agualguáz' del dia 30 de Abril al 1o de mayo de 1931. ¶ Nómbrase Jefe de Dia de hoy para mañana al hermano Teniente Coronel Juan Altamirano, y para mañana el se designe. ¶ Servicio el de rigurosa campaña. ¶ Comuniquese y Cumplase. ¶ Patria y Libertad. ¶ Z. Padilla R. Jefe Expedicionario Provisional." Captured EDSN Guard Book on Atlantic Coast Expedition, April-May 1931, led by Generals Juan Santos Morales, Zacarías Padilla & Pedro Antonio Irías, p. 10. "Orden General de la Jefatura de Operaciones, expedida en 'Ouifurus', del dia 1o al 2 de mayo de 1931. ¶ Nómbrase Oficial de Dia de hoy para mañana al hermano Capitan Fernando Cruz, y para mañana que se designe. ¶ Servicio el de rigurosa campaña. ¶ El hermano Capitan Cruz, que ha sido designado hoy para Oficial de Dia tendrá las mismas atribuciones y responsabilidades que tienen los Jefes Superiores y que son designados para tan honorifico cargo. ¶ Comuniquese y Cumplase. ¶ Patria y Libertad ¶ Z. Padilla R. Jefe Expedicionario Provisional." Captured EDSN Guard Book on Atlantic Coast Expedition, April-May 1931, led by Generals Juan Santos Morales, Zacarías Padilla & Pedro Antonio Irías, p. 11. "Orden General de la Jefatura de Operaciones, expedida en 'Bocay', del dia 2 al 3 de mayo de 1931. ¶ Nómbrase Oficial de Dia de hoy para mañana al hermano Capitan Eudiviges Vallecillo, y para mañana el que se designe. ¶ Servicio el de rigurosa campaña. ¶ Jefes, Oficiales y Soldados. ¶ Queridos Hermanos: ¶ Esta Jefatura de Operaciones há dispuesto que desde esta fecha dejará de fungir como 2o Jefe de la Columna el hermano Sargento Mayor Lázaro Salinas, quien pasa á ser 1er Jefe de Cuerpo de Artillería. ¶ Comuniquese y Cumplase. ¶ Patria y Libertad ¶ Z. Padilla R. ¶ Jefe Espedicionario Provisional." Captured EDSN Guard Book on Atlantic Coast Expedition, April-May 1931, led by Generals Juan Santos Morales, Zacarías Padilla & Pedro Antonio Irías, p. 12. "Adición á la órden anterior, quedan destituidos de nuestra Columna por errores cometidos que merecen la pena de fucilamiento, los militares siguientes: Felipe Urbina y Francisco Montenegro; no se procede á ejecutar el fucilamiento por que existe entre los dos atenuantes aunque pocos, pero semi-justificados. ¶ Vale. ¶ Orden General de la Jefatura de Operaciones, expedida en Bocay, del dia 3 al 4 de mayo de 1931. ¶ Nómbrase Jefe de Día de hoy para mañana, al hermano Teniente Coronel Pedro Navarro y para mañana el que se designe. ¶ Servicio el de rigurosa campaña. ¶ Comuniquese y Cumplase. ¶ Patria y Libertad ¶ Z. Padilla R. Jefe Expedicionario Provisional." Captured EDSN Guard Book on Atlantic Coast Expedition, April-May 1931, led by Generals Juan Santos Morales, Zacarías Padilla & Pedro Antonio Irías, p. 13. "Orden General de la Jefatura de Operaciones, expedida en 'La Marrana', del dia 5 al 6 de Mayo de 1931. ¶ Nómbrase Jefe de Día de hoy para mañana, al hermano Teniente Coronel Juan Altamirano, y para mañana al que se designe. ¶ Servicio el acustumbrado. ¶ Comuniquese y Cumplase. ¶ Patria y Libertad ¶ Z. Padilla R. ¶ Jefe Espedicionario Provicional. ¶ Orden General de la Jefatura de Operaciones, expedida en 'El Triunfo' del día 8 al 9 mayo de 1931. ¶ Nómbrase Jefe de Día de hoy para mañana al hermano Coronel Pedro Navarro y para mañana el que se designe." Captured EDSN Guard Book on Atlantic Coast Expedition, April-May 1931, led by Generals Juan Santos Morales, Zacarías Padilla & Pedro Antonio Irías, p. 14. "Servicio el de rigurosa campaña. ¶ Comuniquese y Cumplase. ¶ Patria y Libertad ¶ Z. Padilla R. Jefe Expedicionario Provisional. ¶ Orden General de la Jefatura de Operaciones, expedida en 'Quitriz', del dia 9 al 10 de mayo de 1931. ¶ Nómbrase Jefe de Dia de hoy para mañana al hermano Sargento Mayor Lázaro Salinas, y para mañana el que se designe. ¶ Servicio el de rigurosa campaña. ¶ Reconocerán como ayudante de esta Jefatura de Operaciones, en reposición del Sub-Teniente Ignacio Blandón Ríos, al Sub-Teniente Cleto Centeno. ¶ Comuniquese y Cumplase." Captured EDSN Guard Book on Atlantic Coast Expedition, April-May 1931, led by Generals Juan Santos Morales, Zacarías Padilla & Pedro Antonio Irías, p. 15. "Patria y Libertad ¶ Z. Padilla R. ¶ Jefe Espedicionario Provicional. ¶ Orden General expedida en el Campamento de Operaciones militares de la Columna No 3o para el dia 29 de Mayo de 1931. ¶ Servicio el de rigurosa campaña. Nombrase Oficial de dia para hoy al Capitan Eudiviges Vallecio y para mañana el que se designe. ¶ Jefes, Oficiales y Soldados. ¶ Como no se habia podido haser la organizacion de la Columna que esta vajo mi mando por motivo que estava toda junta, hoy que ya esta aqui la gente que habia quedado bajo el mando del Coronel Blandon la organizacion en la forma siguiente. ¶ La abansadia queda como primer Jefe de ella el Capitan Eudiviges Vallecio y como 2o el que nombre el mismo Capital Vallecio. ¶ Artillería queda como primer Jefe el Sargento Mayor Lasaro Salinas, 2o el Capitan Adolfo Salinas, y como 3o el que ellos quieran nombrar. Estado Mayor 1o Jefe el Coronel Dionicio Centeno, 2o Jefe y como tercero el que se nombre. Ayudantes del Jefe de operaciones 1o ayudante el Teniente …"
Letter from Gen. C. B. Matthews, Jefe Director GN, Managua, to Sr. don Manuel C. y Bordas, Cabo Gracias a Dios, p. 1. Letter from Gen. C. B. Matthews, Jefe Director GN, Managua, to Sr. don Manuel C. y Bordas, Cabo Gracias a Dios, p. 2.